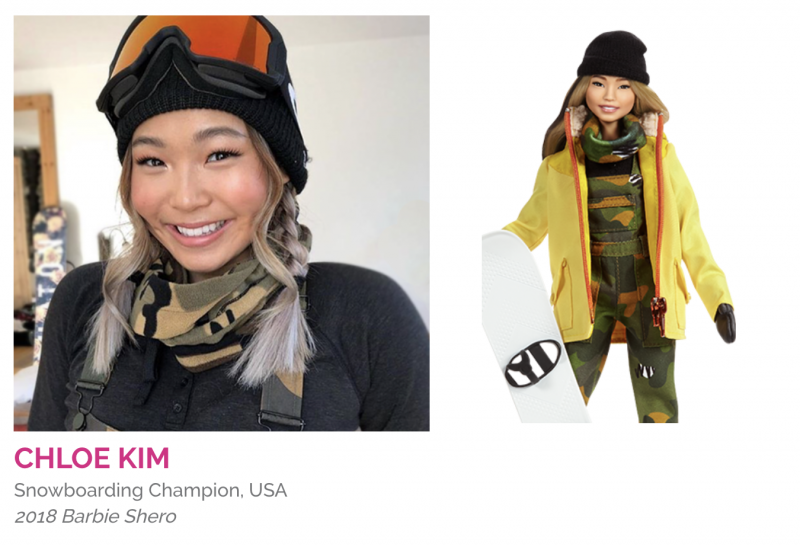 Just a few days ahead of International Women’s Day, Barbie unveiled its new collection under the title “Barbie Celebrates Role Models,” which includes a Barbie doll inspired by Korean-American snowboarding champion Chloe Kim. On March 6, Mattel, maker of Barbie, released a series of 14 new dolls based on real-life figures. As a continuation of its 2015 “Shero” program, the newly added dolls, too, celebrates female figures who have displayed exceptional talents in their fields. American snowboarding gold medalist Chloe Kim, who recently became the youngest woman to win an Olympic snowboarding medal at the age of 17, was one of the 14 figures Barbie celebrated. “Chloe is constantly pushing the sport of snowboarding to new levels, showing girls everywhere the impressive heights they can reach,” introduces Barbie. The 17-year-old snowboarder also shared excitements through Twitter. Honored along with Chloe Kim are filmmaker Patty Jenkins, volleyball champion Hui Ruoqi, Journalist Martyna Wojciechowska, and more women from various fields and countries. Mattel also introduced three new “Inspiring Women” dolls, which include Frida Kahlo, Amelia Earhart, and Katherine Johnson.